Christianity has its traditions and religious practices. We often persist in them with unexamined acceptance. And if we do question our behaviors, we can often find a verse in the Bible to justify them. But that doesn’t make them right. We need to interpret scripture through the lens of scripture and not from the perspective of our own practices. 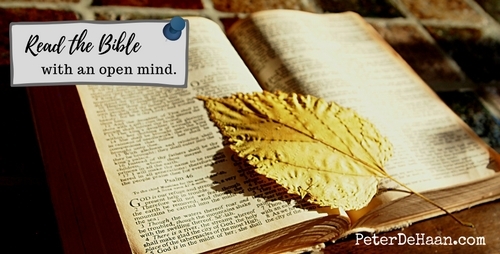 The Bible is the starting point, not the ending. When we begin with what we do today and work backwards, looking to the Bible for support, we will usually find it, but we may be in error. Church Attendance: The Bible says to not give up meeting together (Hebrews 10:25). Most people interpret this as a command to go to church. That’s not what the verse says. This command is a call to Christian community. This may happen at church on a Sunday morning, but it could also happen at a different location the other 167 hours of the week. This meeting together thing happens whenever two or three are gathered in his name. The point of this verse is that we shouldn’t attempt to live our faith in isolation. Communion: Another area is our practice of communion. We even read the Bible when we partake. This makes us wrongly conclude that our celebration of communion is biblical. It’s not. The context of communion is at home with family, not as part of a church service. We’re doing communion wrong. Sermon: Why do we have a sermon every Sunday at church? Because it’s in the Bible, right? Yet biblical preaching is to those outside the church. You’ve heard the phrase, “preaching to the choir,” which is understood as the futility of telling people the things they already know. Yet preaching to the choir is effectively what we do at most churches every Sunday. Preaching is for people outside the church. Worship Music: Why does a significant portion of our Sunday service include music? While singing to God is prevalent throughout the Bible, it’s interesting to note that nowhere in the New Testament is the use of musical instruments mentioned. Does this mean our singing to God should be a capella? It’s worth considering. And the idea of having a worship leader is also an anathema to the biblical narrative. When we gather together we should all be prepared to share and to participate, which might include leading the group in a song. Sunday School: The justification for Sunday School—aside from tradition and “that’s the way we’ve always done it”—often comes from the Old Testament verses to train up a child (Proverbs 22:6) and teach your children (Deuteronomy 11:19 and Deuteronomy 6:6-8). But who’s to do this training? The parents. Delegating this critical job to the church is lazy parenting. But if we’re going to persist in the practice, let’s at least give Sunday School a meaningful purpose. Tithing: Giving 10 percent is an Old Testament thing. The New Testament never commands us to tithe. Think about that the next time you hear a minister say we’re supposed to give 10 percent to the local church. That’s wrong. Though tithing might be a spiritual discipline, it’s not a command. Offerings: Though there is some basis for the Sunday offering, we’ve co-opted it into something it wasn’t meant to be. Paul’s instruction to take up a collection each week was for the express purpose of giving money to those in need (1 Corinthians 16:1-2). How much of a church’s weekly offering goes to that? Paid Staff: The concept of professional, paid clergy also didn’t occur until a couple centuries after the early church started. Peter tells us that we are all priests (1 Peter 2:5, 9), and Paul tells us that we should minister to each other (1 Corinthians 14:26). When we pay staff to do what we’re supposed to be doing ourselves, we’re subjugating our responsibility and acting with laziness. Paul set a great example, often paying his own way on his missionary journeys. Today’s ministers should consider this. Seriously. Prior posts have touched on these subjects in greater detail. They might be worth considering as you contemplate the above items. We persist in these practices out of habit and under the assumption that the Bible commands us to do so. We conclude this because we read the Bible wearing blinders, focusing our attention on our practices and seeking to find them supported in the Bible. It’s time we reexamine everything we do and make needed changes. And if we do, it will be a game-changer.